Click here for a 1945 article describing architectural features of All Saints church by Guy Freeman. Click here for a detailed booklet entitled 'Churches and Chapels of Danehill' by Derek Rawlings. Bodley and Kempe at All Saints Danehill. Notes by Adrian Barlow on the architect (Bodley)and the window designer (Kempe) of All Saints Church, Danehill. Why was this magnificent church built here? A very brief look at 250 years of history to explain. 250 years ago Danehill was nothing more than a wayside Inn and a few houses on a crossroads on the London /East Grinstead /Lewes road. It was then partly Horsted Keynes and mainly the northern part of Fletching. 1750s, Sussex Roads were notorious. The Improvement of the Main Road through Danehill in the 1750s -TURNPIKING - this made travelling between country estates and London and the coast much easier. People with wealth and influence moved into the area. Principally John Baker Holroyd who purchased Sheffield Park and took his title as Earl of Sheffield fro his estate. 1825 Arrival of the two wealthy Davies brothers in this part of what was then Fletching Parish. Their father had accumulated considerable wealth as Attorney General to the East India Company. Now the 3 memorials to the Davies family, moved from Holy Trinity to the back of this church are the only recognition they have. 1851 Danehill Ecclesiastical District was formed from the northern part of Fletching and part of Horsted Keynes parish. The Chapel of ease became a parish church. 1873 New Cemetery was established on land across the road given by a Mr Corbett, who had purchased the Woodgate Estate. 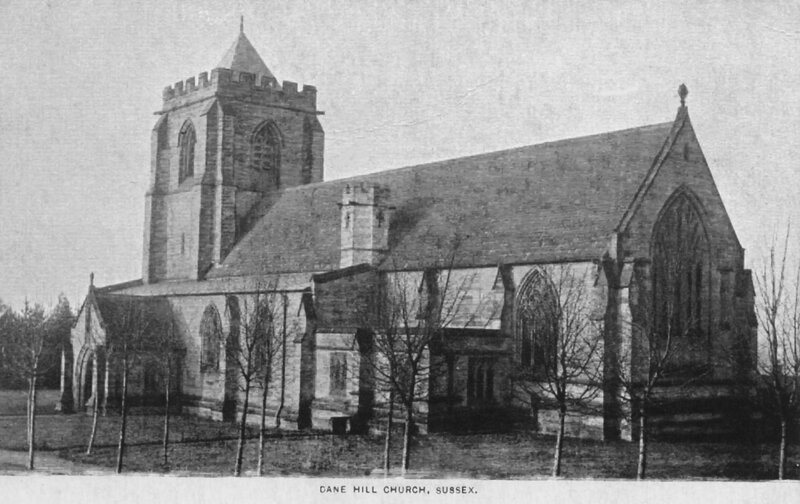 1887 A fire seriously damaged Holy Trinity Church (as it was then), Mr Herbert Carey Hardy who in the early 1870s, had purchased the Danehurst Estate after his marriage to Adela Louisa Cassandra Knight, a great niece of Jane Austen; had the building repaired. Mr Hardy is reputed to have told some of the onlookers of the fire at the Church that "he would provide something better". 1888 However this was not to be, Herbert Carey Hardy broke his leg as a result of an accident while in Scotland. An operation was considered necessary, but unfortunately Mr Hardy did not survive the ordeal. ---1892 The bereaved Mrs Hardy had built in his memory. All Saints Church was consecrated by the Bishop of Chichester, A relative of Mrs Hardy, Mr Austen Leigh, (A master at Eton) played the organ, my father, Albert Lucas “blew” the organ. Later, Holy Trinity Church and some neighbouring cottages were demolished. 1894 Guy Charles Hardy “Came of age” -Photograph on page 6 in book. 1896 Death of the second of the Hardy sons, Herbert Edward who died at Eton, memorial window in the Lady Chapel. 1914-18 War Death of Captain Ronald Montague Hardy in 1915 -Memorial Window and the Memorial by Mary Watts widow of George Frederick Watts erected by Captain Quartermaster Michael Chapman M.C., who was the husband of Mary Watts’ adopted daughter. There is also a memorial tablet to Michael Chapman next to the statuette recording his death in Flanders in 1918. Ronald Montague Hard lived with his mother at Chilworth Manor, very near to Compton in Surrey. 1935 Reredos, by Ninian Comper, erected “In memory of Adela Louisa Cassandra Hardy who built this Church as a memorial to her husband, this reredos is dedicated by her children 1935. I was in the choir at that service. 1949-45 War - A stick of bombs straddled the church, the nearest one landed in the cemetery across the road, one small pane of stained glass in the East Window of the Lady Chapel was hit by shrapnel - a temporary replacement with a piece of plain blue glass was made by the local builder. It is still in position - now as a reminder of how close the church came to being severely damaged.